Protect household items such as linens, clothes, shoes, toys, against dust, dirt, pests in this super convenient under-bed storage bag under standard beds, attics, or closets. A clear vinyl top on the underbed shoe organizer provides easy visibility of contents; no need to unzip to see what's inside! 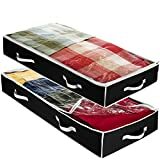 The underbed shoe storage bag is made of breathable, puncture and tear resistant polypropylene panels that help keep items fresh and safe from tears. 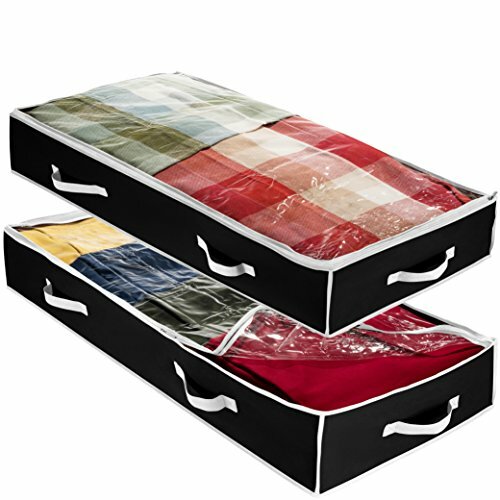 Clear Under Bed Storage Bag - 2 Pack - Durable Vinyl Material to Shield Your Contents from Dust, Dirt and Moisture. Easy Gliding Zipper for Easy Access and Label Pocket for Easy Identification.